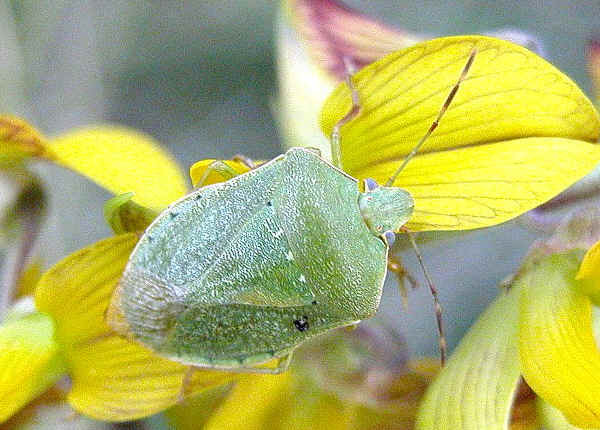 This page contains pictures and information about Green Vegetable Bugs that we found in the Brisbane area, Queensland, Australia. We sometimes found them on tomatoes and other vegetables. The bug is green in colour. 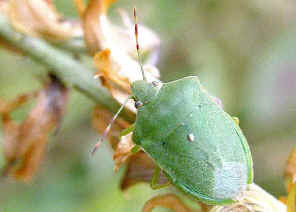 The adults are active and bright green colour in summer. During winter the colour changes to brownish-green to dark brown and inactive hiding in shelter. In the above pictures, the bug is attached with parasite egg on its back. The bug has the rather square head, juga do not surpassing apex of anteclypeus. 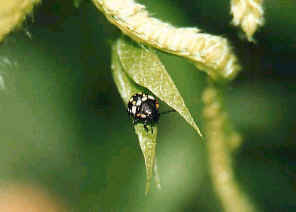 The immature stages are brightly coloured with orange, red, black and green. This is an introduced species and a wide spread pest in the warmer part of the world. There is a lot of information about this bug on the internet. 4. Green Vegetable Bug - Insects Identification and Information Guide, Australian Cotton CRC, 2004. 6. 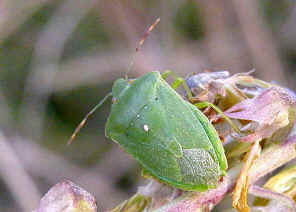 Nezara viridula (Linnaeus) - Australian Insect Common Names, CSIRO 2005. 7. Plant-feeding and Other Bugs (Hemiptera) of South Australia. Heteroptera-Part II - Gross, G.F. (1976). Adelaide: A.B. James, p451. 8. Green vegetable bug - Primary Industries & Fisheries, Queensland.